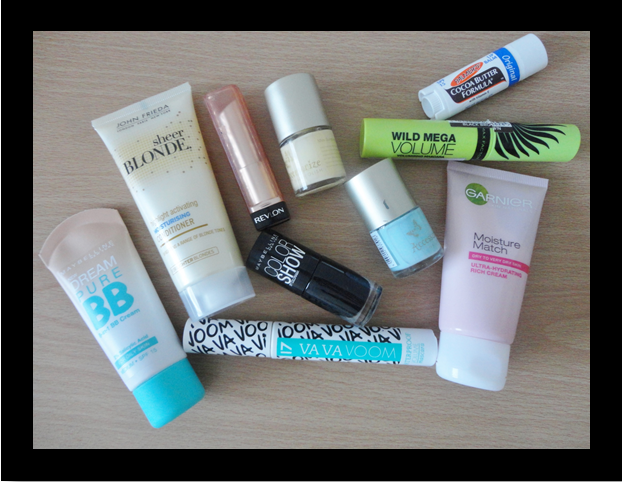 Here are all my beauty product buys for July and I love the all of the ones that I have tried so far. I have wanted to try Garnier Moisture Match for a while now and it is amazing, I love it. I bought the dry skin one and since having it, my skin has been much softer. Another bonus is that it smells amazing. You can buy it from Superdrug, Feelunique.com or Boots. I absolutely love Palmer's Cocoa Butter products, they smell so good and are amazing. So when I found out that the did a lip balm, I was pretty happy. I have one of their skin care product and it makes my skin smell edible, so you can see why I wanted the lip balm. It is awesome and for anyone who love the Cocoa Butter products, this is for you. You can buy it from Superdrug or Boots. 17's Va Va Voom Waterproof mascara and Max Factor's Wild Mega Volume mascara are both products I have not used before so I thought I would check them out and see if they are any good. They are both great products and do not disappoint. 17's Va Va Voom Waterproof mascara is available from Boots for £6.29 and Max Factor's Wild Mega Volume mascara is available from Superdrug for £4.99 (on special offer). Revlon ColorBurst Lip Butter is another great buy and it comes in a lot of great colours. You can buy it from Boots or Superdrug for £7.99. I bought three nail varnishes, two Accessorize and one Maybelline. Accessorize Miss Sunshine and Green Lagoon nail polish costs £2.95 from Superdrug. Maybelline Blackout nail polish costs £2.99 from Superdrug. I also bought the Maybelline Dream Pure BB for oily skin from Superdrug for £6.99 which I have yet to try. John Freeda's Sheer Blonde conditioner is my last beauty product that I have bought this month and am looking forward to using it. You can buy it in Superdrug or Boots.